Join us for open skating at The Rink in Chicago, Illinois. Our building has three different floors, which include a main skating rink and a practice rink. We also offer skating classes for learners of all ages. Take a break between skating sessions and play pool on one of our two regulation pool tables. We also have beanbag games and other recreational activities. In addition, our third smaller floor is a stepping floor reserved for dancing! Monday's are available to for Private Party rental. On Tuesdays, we have old school skating that features "Throw Back Tuesday" & the first hour is "The Old School Hour" from 10:00 a.m. to 2:00 p.m. Admission per session is $10. Wednesday's are available for Private Party rental. Thursday Night is for ages 30 and older. Classes start at 6:30 p.m. and run until 8:00 p.m. for $12. Skating is after that from 8:00 p.m.- midnight. If you come for class you are welcome to stay for the skating session at no additional charge. Admission for the session only is $10 and $1 to rent skates. The Rink is always available for rental during all other times. The rink is open 7:00 p.m. and 11:00 p.m. Regular admission is $8 and Skate Rental is $1. We also accept groupons on this session. The Rink is always available for rental during all other times. Saturday classes are for all ages. Doors open at 9:00 a.m. classes start at 10:00 a.m. and run until 11:30 a.m. for $10. Family Skating is after that from 12:00 p.m. to 3:00 p.m. If you come for class you are welcome to stay for the Family Skating session at no additional charge. Admission for the Family Skating session only is $6 and Skate Rental is $1. We also accept groupons on this session. The Rink is always available for rental during all other times. Sunday evening is adult skating for ages 30 and older from 5:00 p.m. to 9:00 p.m.and there is no skate rental available. Admission is $10. Following that session is adult skating ages 18 and over from 9:30 p.m. to 1:30 a.m. to JB music. Admission is $10 and $12 if you don't have skates. The Rink is always available for rental during all other times. 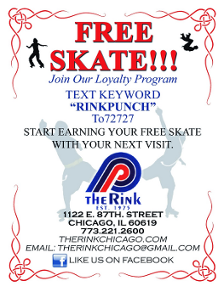 Contact us at (773) 221-2600 to learn more about Private Party/Fundraiser Rentals, Kid's Birthday parties or skate lessons.